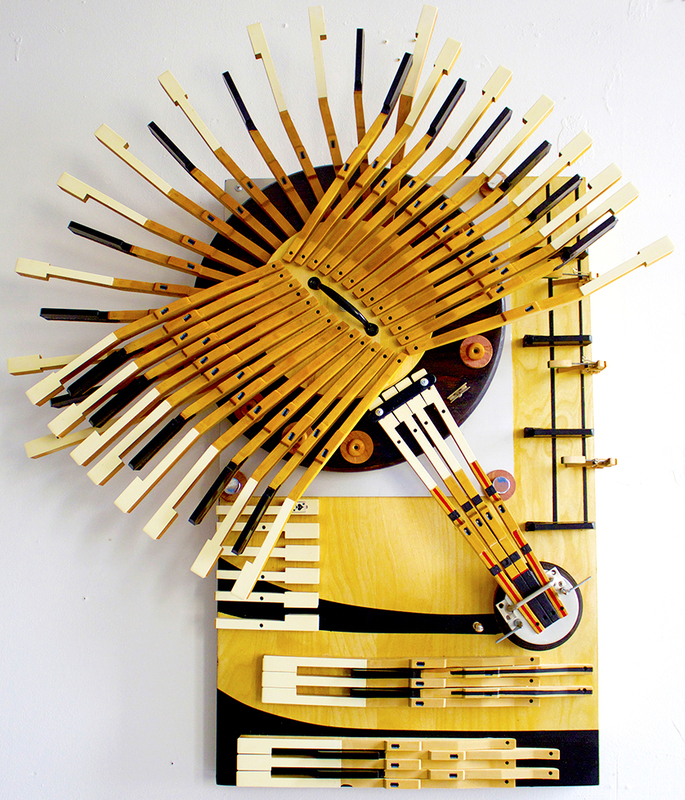 Description: ‘Middle C’ is a mixed media / raised relief sculpture I created using the internal parts from an upright piano, in combination with other miscellaneous parts from household appliances. I specifically gutted an old piano in order to retrieve its keys. I designed and built this art so that it could spin in order to provide the viewer with many different aesthetic choices and perspectives. It was important to me that the piece looked like it moved as well as it actually doing so. I referenced the spokes on a bicycle, engineering the center of the sculpture on bearings, allowing the top row of keys to swivel manually, which provided it the ability to glide smoothly over the 2nd row of keys beneath. This movement creates a consistently shifting depth throughout the piece. I believe pieces of art that can be changed to the desired look of the viewer’s preference is an effective way to share empathy. The mood of the piece can be changed by manually changing the position of the piano keys. (Spinning It To Desired Position) As humans our moods are continually changing and my goal with this piece was to make a piece that would change with it.